Where can your wind turbine be used ? Click here to see the testing vedio . What other products are needed in your complete wind system ? Click here to see the complete wind system connection vedio . 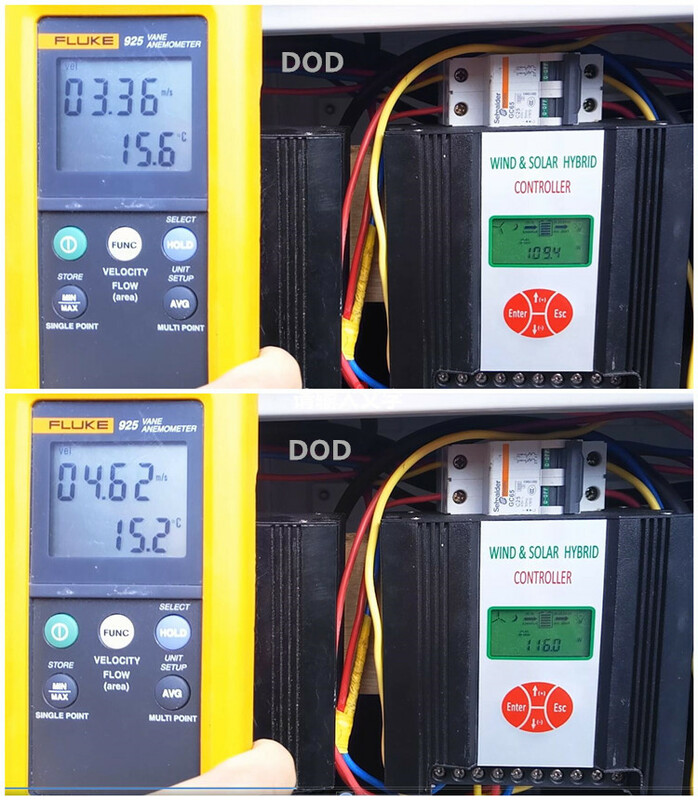 If you want a stand-alone off-grid wind system , then you need the wind controller , battery and a DC to AC power inverter . If you want the power from wind turbine directly go the state grid , then you just need an on-grid wind inverter , this inverter no need any charge controller . 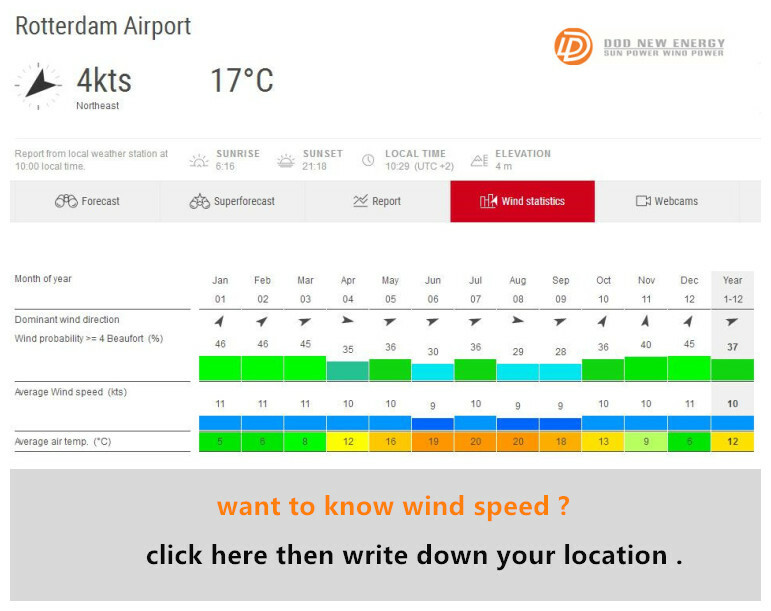 What if the wind speed at my area is low ? if the wind speed at your place is low , and can't generate enough power to meet your demands , then you can choose a wind/solar hybrid system . when no wind , there is solar panel which can produce some power for you . What if the wind speed at my area is too strong ? 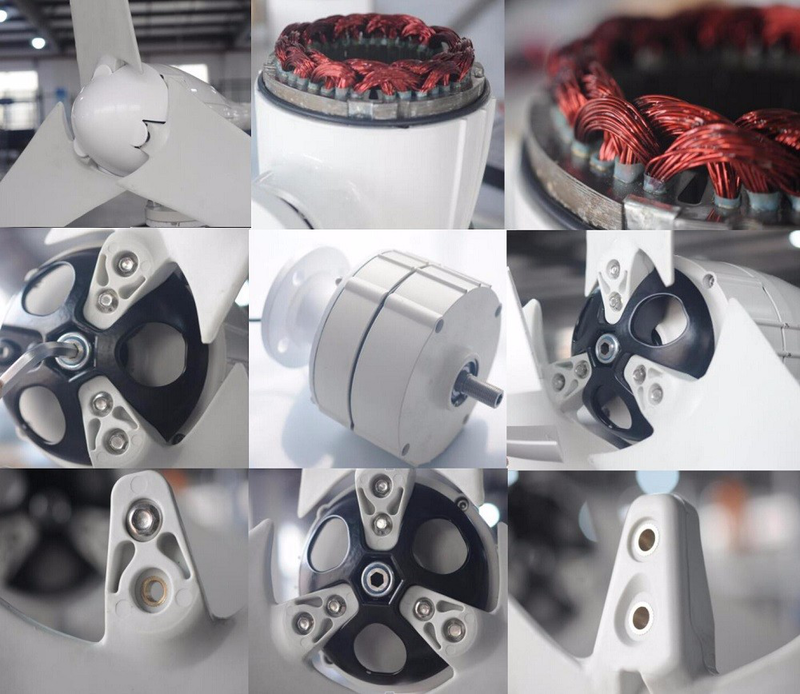 our wind generator survival wind speed is 50m/s , and if the wind speed become too strong , overvoltage or over charging current , the wind turbine will brake automatically , 10minutes later , it will work normally again . 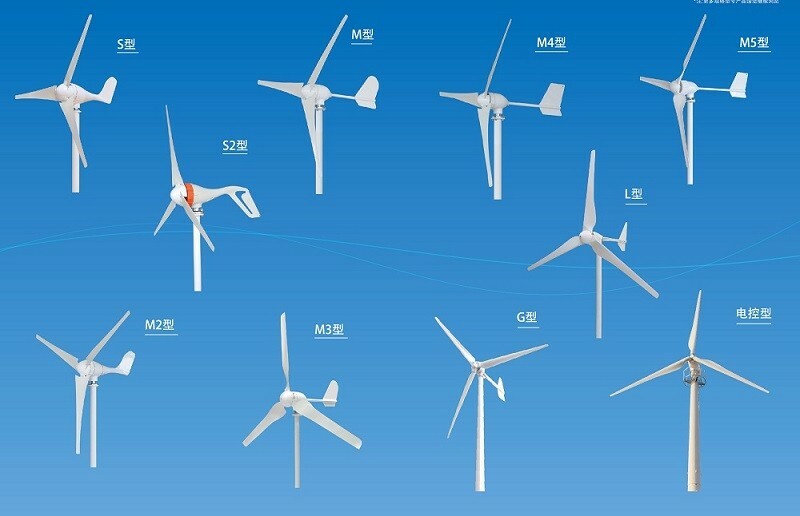 What's your wind turbine specification ? How can I know if the wind speed at my place suitable for your wind system ? our wind turbine start wind speed is very low , at about 2-3m/s , so if your annual wind speed is over 5m/s , it is good to use our wind generator . 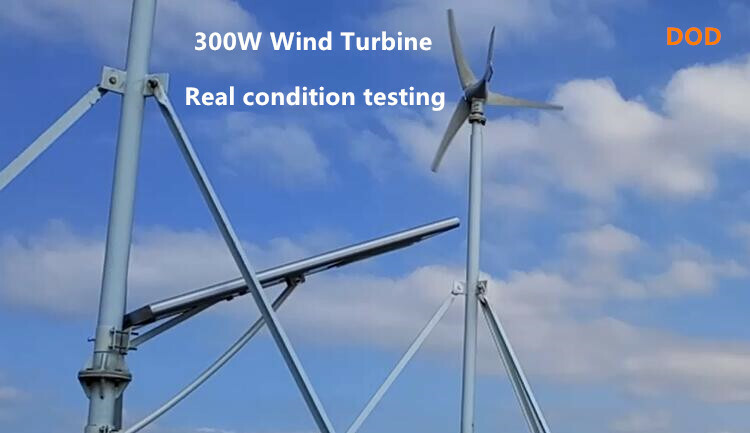 we've been in wind energy for 8 years , we have the wind speed data at most places , you can tell us your installing place , we'll check it and suggest you the best suitable model for you . Why your wind turbine so hot-selling ? 3. Aluminum alloy body . 4. Stainless steel screws . 5. Using built-in design , no screws on surface , more beautiful and perfectly meet the industrial requirement . 6. Yaw shaft inside the body , making connecting area of the yaw and the host machine body larger , which make the machine more safe . 7. low noise design . 8. High-strength nylon fiber glass blades , strong and durable . we provide a complete wind system , the off-grid and on-grid wind controller , off-grid and on-grid inverter , tower , Gel battery , those products can match our wind generator perfectly , which makes the whole wind system working at its best efficiency . What the best distance between two wind gnerator ? 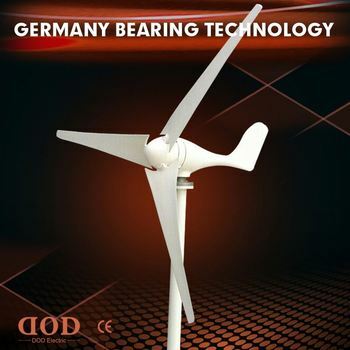 the distance is decided by the wind turbine wheel diameter and its blades length , click here then write down your wind turbine specs , we will suggest you the best installing distance and points for attention when installing . Which powers do you have ? DOD New energy is high technology company which specialized in solar power system,wind power system and related products. We have branch in Zhejiang and Sichuan province. 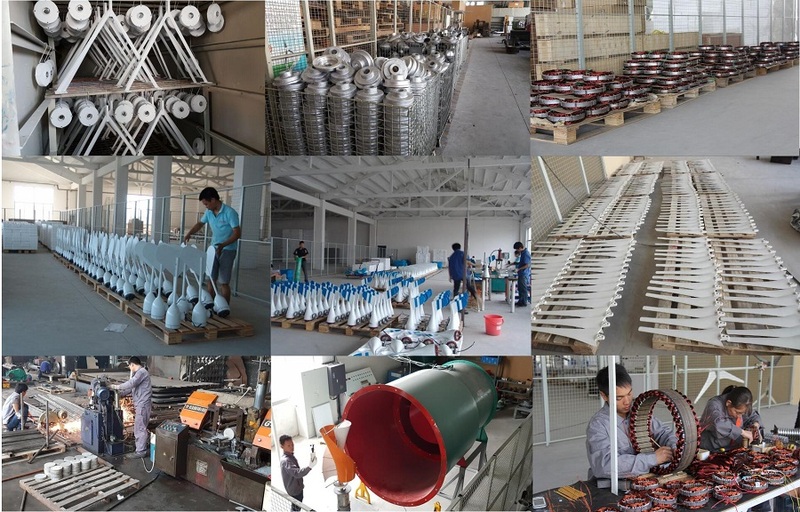 Main products contains wind generator ,solar panel,solar charge controller,power inverter ,battery etc and most export to Europe and America. Till now we have got ISO, TUV, CE, ROHS,IEC,SGS,UL Approval. What kind of service you can provide ? Pure sine wave power inverter ,with output 110v/120v/220v/230v. 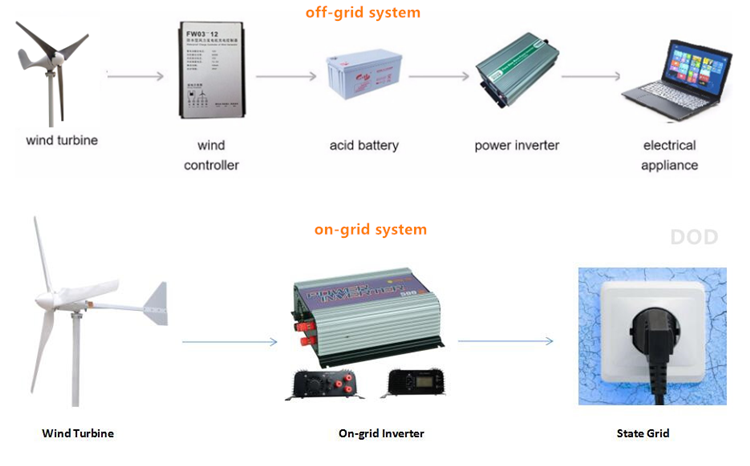 Gird tie wind inverter , connect with wind turbine and grid directly ,AC input ,do not need an extra wind controller .much easy for installation and reduce costs. According to our client power consumption request ,we can design a suitable power system . The system we designed not only can meet our client need, but also consider to make system costs is most cost-effective. In our real business ,most customer can affordable and happy with the price we offer. We have professional engineer which work in wind power field for over 10 years, we can give you professorial technical advice and trips for reduce costs. We offer life long technical support once you purchase our wind power system. Q1 : How can i buy a sample ? 3.Start an order with us. You can click “start order” of the top of this page, then we will receive the order ,we will make the contract with you online. 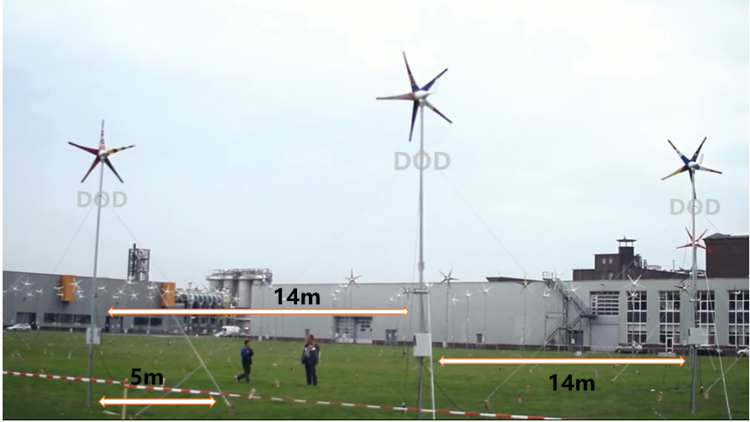 Q2:How to install the wind turbine ? We will offer you a paper installation manual with the goods .we will offer you the tools with the spare parts with the goods. For Big wind turbine like 3kw-10kw , you may need use crane ,you need rent one . Q3: What parts needed to make a complete wind power system ? 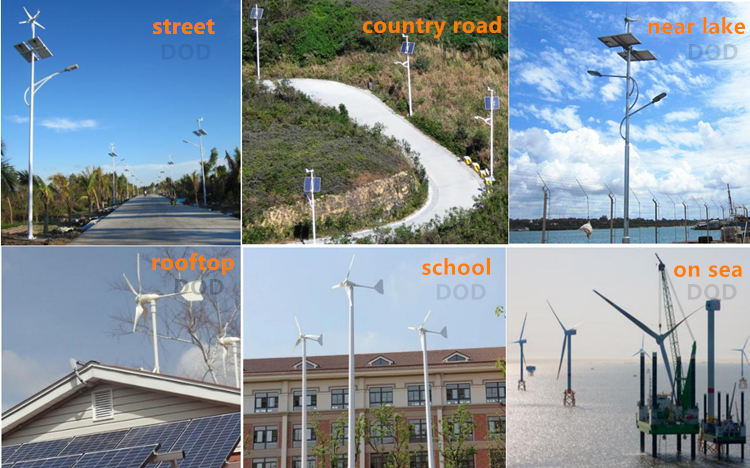 To make a complete off gird wind power system ,you will need : wind turbine ,tower,wind controller ,battery ,inverter. 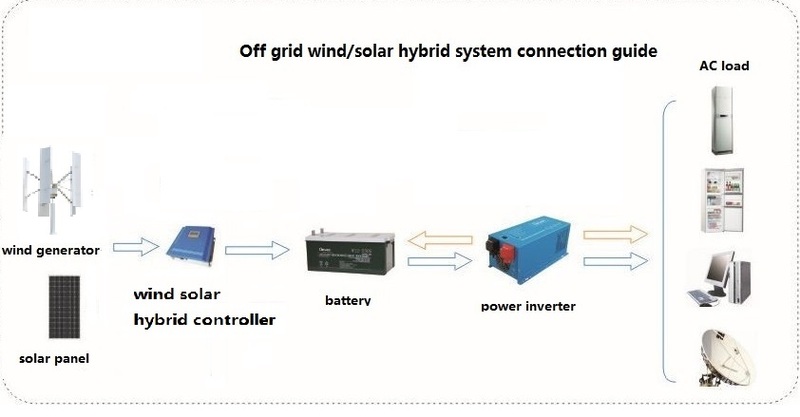 To make a complete off grid wind solar power system , you will need :wind turbine ,solar panel ,tower,wind solar hybrid controller, battery ,inverter. Pls contact us if you need more information about complete system. Q4: What other components are needed besides your common package ? we've packed all the components you need , what you need to prepare is just some common installing tools. Q4:How is packing and shipping ? 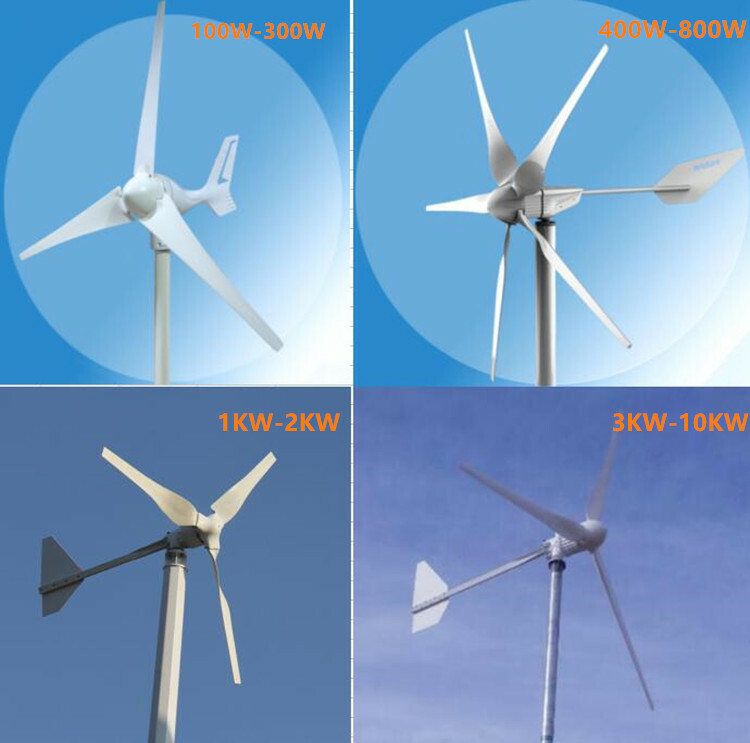 Small Wind turbine (100W-1000W) usually we packed in cartons ,Big wind turbine (2000W -10KW) packed in wooden case ,including wind turbine motor ,blades, cone ,spare parts ,manual. 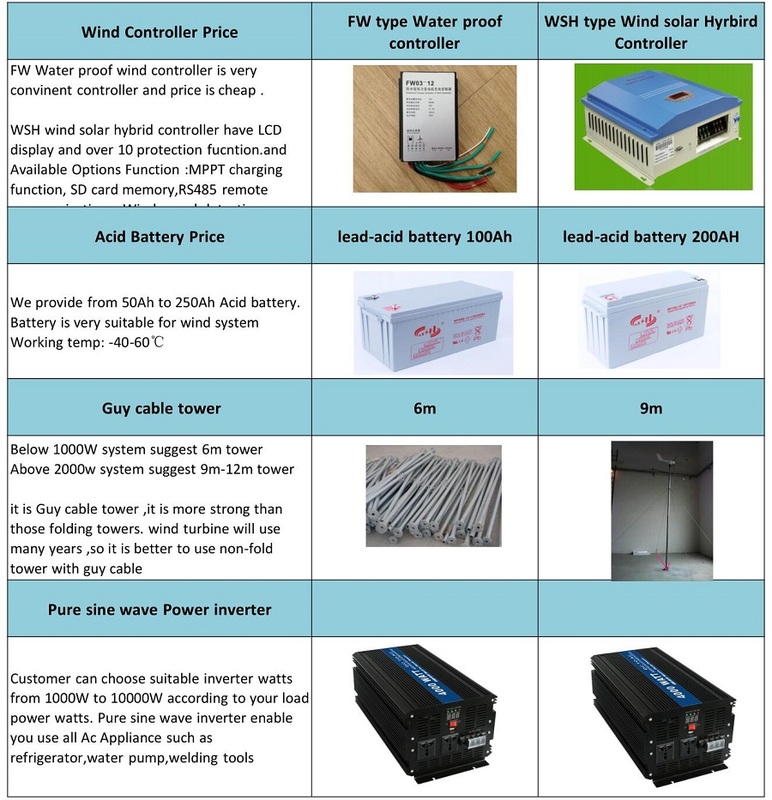 Wind controller /wind inverter /battery will see the power watts to decide packing in carton or wooden case. For shipping ,we can send you door to door by International express like DHL, FedEx,TNT,UPS etc for small parcel within 3-6 days. Also we can delivery goods by sea for bulk orders to your nearest port. 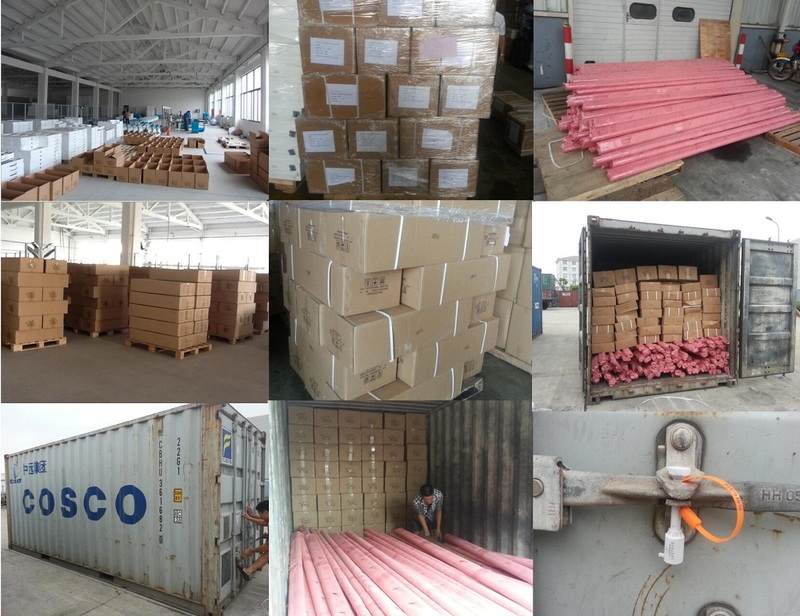 For detail packing dimension , pls contact our sales. Q5:What is the delivery time ? For sample order below 10 pcs , we usually have stock and can delivery goods in 5-7 days. Q6: What is the payment terms ? Can we use Trade Assurance through Alibaba ? We accept Bank TT, Paypal, L/C and RMB payment. Q7: What is the Quality warranty ? All our wind turbine is warranty 3 Years, other parts are 1 year warranty. 1. Very Rich experience to design and install wind power system. we have cooperate with many domestic and over sea project. Supply to over 30 counties and install over 20,000 sets wind turbine so far. 2. We provide life long technical support once you purchase wind power system from us. 3. Price Advantage. Since we are factory, with our strategy upstream supplier support ,our spare parts are very competitive in both price and quality. We offer this profit range to our customers and hope to help our customer to win more market share. 4. We can provide complete system parts . customer can purchase all the parts from us in one time, and we give our customer discount all together. Help customer save time and money.